If you are new to food storage and following along with the BabySteps Summer Crash Course, please refer to the recently updated Step 2: Water page before you read this post and get overwhelmed. Our recommendation for beginners is to simply get a 2 week supply of water for your family (1 gallon per day per person). An evaporation still will extract water from the soil even if it appears to be quite dry. These instructions will help you create a still that will provide half the amount of water needed for one person per day. It’s definitely more convenient to simply store water, but for a longer term emergency you may find it necessary to find alternate means of accessing water. Dig a hole three feet deep and large enough at the bottom to hold the bucket or container. Place one end of the drinking tube at the bottom of the bucket and put the bucket in the hole. If possible, line the sides of the hole with shredded vegetation and slices of succulent plants. Place the plastic over the hole, securing the edges all around with soil. Extend the drinking tube from the bucket under the plastic and up through the soil that holds the plastic in place. Wrap a towel or clean cloth around the end of the tube to protect it from soil and contamination. 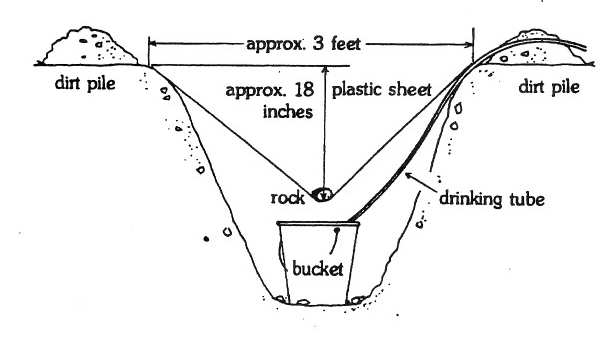 Position a rock in the center of the plastic sheet two or three inches above and directly over the bucket. Water will accumulate in the bucket and can be sipped through the tube without dismantling the still. Make sure that you print out this post and put it in your Food Storage Made Easy Binder so that you can have it on hand in case of an emergency where you don’t have power.